President of National Farmers' Alliance, 1889-1892; began Progressive Farmer, 1886; a founder of N.C.S.U. and Meredith College. House is here. Leonidas LaFayette Polk was a nationally known farmer, editor and politician in the late nineteenth century. Polk founded The Progressive Farmer in 1886, and served as the president of the National Farmers’ Alliance between 1889 and 1892. He contributed to the founding of what is now North Carolina State University in 1887 and Baptist Female University (present-day Meredith College) in 1891. Polk helped create the state Department of Agriculture and was the first Commissioner of Agriculture. He was the 1892 Populist Party presidential candidate but died before the general election. Polk was born in 1837 in Anson County into a middle-class farming family. Orphaned at fourteen, Polk inherited a 350-acre share of his father’s estate along with his three half-brothers. Polk wanted to be a “gentleman farmer” and attended Davidson College for one year in 1855 before returning to Anson County. In 1860, Polk began his political career when he was elected to the state House of Commons as a Unionist Whig. Switching his allegiances with Lincoln’s call for troops, Polk served in the Confederate army. Returning to his home in Anson County, Polk began to advocate for farmers’ rights, developing a chapter of the Grange, an alliance group of small farmers, and The Ansonian, a weekly paper supporting the development of a state department for agriculture. In 1877 Governor Zebulon B. Vance created the North Carolina Department of Agriculture with Polk as the first commissioner. Polk resigned three years later and in 1886 began a weekly paper for farmers, The Progressive Farmer. 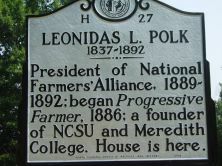 Polk used The Progressive Farmer to promote the creation of a “practical” state university, separate from the University of North Carolina. In 1889, the North Carolina College of Agriculture and Mechanical Arts was created. Polk also advocated for the creation of the Baptist Female University, which was founded in 1891. Polk’s helped establish the Farmers’ Alliance, a Texas-based organization, in North Carolina in 1887. Polk served as a member of the executive committee of the National Farmers’ Alliance before becoming the group’s president in 1889 and serving until 1892. He forged close links between the Alliance and the new People’s Party (Populist Party). With his high profile position in the Alliance, Polk became a leader of the new third-party Populists, which soon gained strength in the South and the West. Polk quickly became the Populists’ presumptive presidential nominee. However, he died on June 11, 1892, well before the general election. 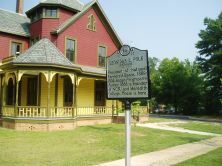 Leonidas L. Polk’s house, a three-story gingerbread Gothic structure, was constructed on North Person Street in Raleigh in 1891. In the 1960s it was nearly destroyed before being relocated. After being joined to the back of a North Blount Street house for nearly forty years, the Polk house was purchased in 1995 by the Leonidas L. Polk House Foundation and was moved again, to its present location on North Blount Street.